To me, the choice was clear when Theresa May saw her chance and called a general election. What kind of country will Britain be? What part will it play in the existential questions faced by the world? At the heart of that is Brexit, because, economic stormclouds aside, it disconnects the British people from their neighbours, obstructs collaboration and pushes the country into an adversarial corner, more beholden than before to a special relationship with Donald Trump. Brexit sets a future that was not chosen by the young, who were born into an interconnected world. And how did this occur? A narrow majority was procured with extravagant lies wrapped in “patriotic” newspapers with salt and vinegar. The Conservative/UKIP line is that both sides spoke untruths in the heat of campaigning, and the people’s decision has put an end to it. This view is routinely put by Today programme interviewers to anyone who raises the untruths promoted by the Leave campaign, but there is no objective equivalence. The economy’s allegedly strong performance that disproved Project Fear was fuelled by two things: Bank of England stimulus (cutting interest rates, purchasing £60 billion worth of government bonds and another £10 billion of corporate bonds, and providing £100 billion funding to commercial banks), and - not unrelated – a massive increase in household debt. The economic impact of Brexit is not yet in the balance, since we still have access to open markets, supply chains, skills and labour. Not that the post-Brexit economic miracle has eased the mantra of austerity. The government’s outlook demands that school spending per pupil must be cut, £400 million more must be squeezed from frontline policing in the metropolis, the health service must abandon longstanding targets and the costs of home care for the elderly (for which they have paid a lifetime of unhypothecated national insurance contributions) must be levied from their estate up to a level to be decided by the government after the vote, since supporting an ageing population will become substantially more costly for the working population if net migration is reduced to the tens of thousands. Jeremy Corbyn has best voiced the moral considerations around immigration, but the country’s self-interest in this matter (which is generally held to be all that matters at election time) was best expressed by former austerity Chancellor George Osborne, reborn as the editor of the London Evening Standard, in an editorial the day before Theresa May reaffirmed her attachment to the tens of thousands net migration “aim”. On the economic question, I am for once with George. 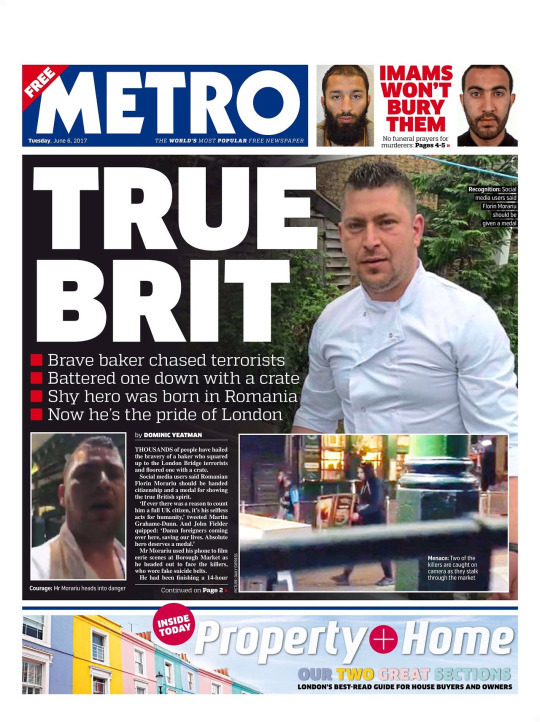 On the moral question, I’m with Jeremy and with the Metro, which on its 6 June front page described Romanian baker Florin Morariu, who’d stood up to the Borough Market terrorists, as a “true Brit”. Brexit is a retrogressive, xenophobic act of self harm. It was won on the basis of stirring up division not only by the right-wing press but also by Boris Johnson, who as Mayor of London betrayed his city, and who connived in the racist dogwhistle campaign fought by Zac Goldsmith against Sadiq Khan over who should replace him at City Hall. So at the start of this campaign, I was with Boris’s younger sister, ready to support the only party that was unequivocally against Brexit. The pleas of friends, who pointed to the viciousness of public spending cuts, fell on deaf ears since it was the many who had been most duped by Brexit and Labour had no answer for them. A general election undoubtedly trumps a referendum, so this was an opportunity to look at it again, as the Lib Dems had done effectively in Richmond Park. Turning 48% into 50+ is not such an impossible ambition, when the mendacity has become so much more evident. This idea, however, has not been widely shared. In the absence of another popular vote, politicians are obliged to respect democracy and carry out the result of a referendum. But it was never the case that the electorate cannot change its mind, at any time and for any reason. Yet the BBC and most mainstream Remain politicians have accepted the Conservative/UKIP and Daily Mail line that to argue against the referendum result in the general election is undemocratic. The Lib Dems, who failed to capitalise when they were were right over Iraq, have failed once more to get traction with the electorate over this issue and the choice is between a Conservative government indistinguishable from UKIP, and Jeremy Corbyn as prime minister. In this atmosphere, we have been overtaken by events in Manchester and London. Unsettled already by the response to their home care proposals, the Conservatives are vulnerable to questions about Theresa May’s record as home secretary, where she made significant cuts to community policing, replaced control orders with the TPIM device that has been used only once, and established the Prevent programme in a way that Manchester Mayor Andy Burnham describes as fatally flawed. 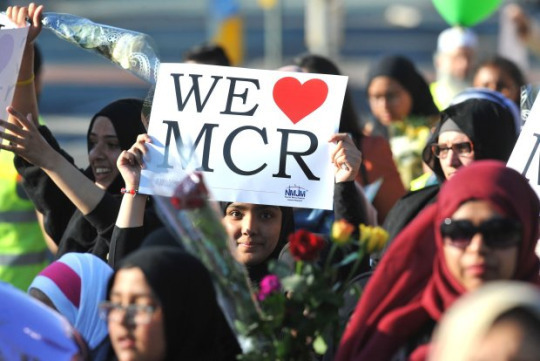 Days after the One Love Manchester concert and the tearful pleas in both cities for unity, the Conservative response is to go to the UKIP tool in the shed, choosing division and talking tough on length of custodial sentences and tearing up the Human Rights Act without any evidence that either of these played any part in the attacks or would make any difference in the future. The discussion about police numbers, on the other hand, is relevant. The line that Theresa May has protected “terror police” numbers and that frontline numbers are not material is not defensible, when all the perpetrators had been reported and were on the security radar. The security and anti-terrorist agencies cannot work in isolation. Community policing by consent from all our communities is the essential cornerstone to underpin their work. To achieve this, police numbers must not only be restored but very significantly increased. Blairites4Corbyn? Iraq aside, socially and economically I remain a Blairite. But on the most important question about what kind of country Britain will be, it is Jeremy Corbyn, Andy Burnham and Sadiq Khan who have come up with the right answers – and I’ve even been impressed with Keir Starmer’s Brexit approach in his recent interview with Owen Jones. Economically too, much sense has been spoken by Labour in this campaign: investment in infrastructure, skills and education, combined with a collaborative relationship with our main trading partners, are not a bad starting point for being competitive in the modern world. But the bottom line is that the hottest places in hell are reserved for those who in a period of moral crisis preserve their neutrality, as John F. Kennedy famously misquoted Dante. I have no reason to think that my new idea will be more widely shared than the last one, but the choice is still about what kind of country Britain will be, and what I’ve concluded is that tomorrow, it’s TrueBrits4Corbyn. I’ve been a lifelong Labour supporter, yes, but this is not a tribal plea. There are many Conservatives who I agree with, even admire, and am happy to work with. It is a plea instead to people of all political hues to set tribal feelings aside, reject the UKIP tool of division and decline Theresa May’s invitation to take us down to the nasty country.